The Drop features James Gandolfini's final film performance, and, while hardly a stretch for the late actor, it's worth seeing. Playing the eponymous owner of a Brooklyn bar called Cousin Marv's, who sampled the criminal life in his younger years, Gandolfini exudes the short-fused frustration of a man who wanted to be an alpha dog but ended up a small-timer. (Marv has been reduced to allowing the local Chechen mob to use his bar as an occasional "drop" for its ill-gotten gains.) While the character is far from likable, the performance is more proof (as if we needed any) that the actor himself was no flash in the pan. The film surrounding that performance, however, never quite adds up to the sum of its promising parts, which also include director Michaël R. Roskam (the Oscar-nominated Bullhead), writer Dennis Lehane (Mystic River) and rising stars Tom Hardy and Noomi Rapace. This gritty urban drama suffers from turgid pacing and heavy-handed scripting, its strong finish coming too late to redeem the rest. Despite the title, don't come expecting a high-tension crime tale. First and foremost, The Drop is the portrait of an "Animal Rescue" — the name of the short story from which Lehane adapted his script, transplanting it from Boston to Brooklyn. Our protagonist is lonely Bob Saginowski (Hardy), Marv's cousin and bartender, who discovers a whimpering pit-bull puppy in the trash one night. The trashcan belongs to a young woman named Nadia (Rapace), who convinces Bob to take responsibility for the abused dog and begins a tentative relationship with him. Neither of these characters is prone to discussing past sins — or discussing anything, really — but it's heavily implied that both seek some form of redemption. After two punks jack the drop bar, Bob chats with a detective (John Ortiz) who's noticed his habit of attending early mass and asks why he never takes communion. When Bob responds defensively, it's practically a signpost for the audience: Harrowing Confessions Ahead. Worse, the viewer soon learns that Marv's lingering ambitions are on a collision course with Bob's quest for a normal life. 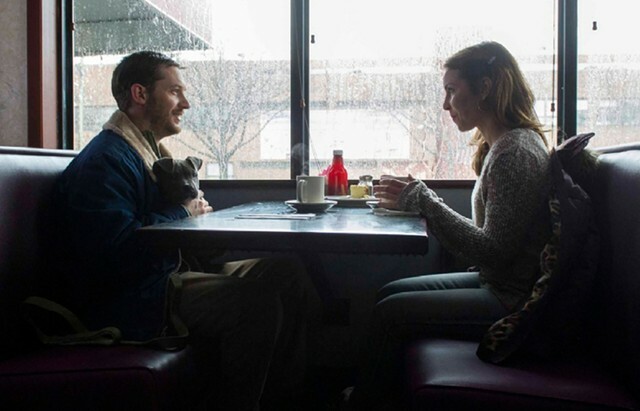 As the study of two inarticulate, hard-luck people drawn together in a sort-of-romance, The Drop recalls Nicolas Winding Refn's Drive, but it lacks that film's clever pacing and stylistic fireworks. Instead, Roskam offers us a series of conversations filmed in close-ups in dim, claustrophobia-inducing interiors. To say he captures the gloom of the city's seedier corners in late winter is an understatement. But the gloom seeps into the whole movie, making it feel longer and draggier than it is. Hardy gives a strong performance, stoicism alternating with vulnerability, and the viewer who doesn't root for Bob and his dog is heartless indeed. (If you must know in advance whether the pup survives the film, look it up on doesthedogdie.com. Yes, that's a real thing.) It's harder to care about Bob's relationship with Nadia, or her relationship with a lackadaisical fellow (Matthias Schoenaerts) who claims to be the dog's rightful owner. Though Schoenaerts, who starred in Bullhead, delivers artfully modulated menace, his character has been braided so clumsily into the central narrative that he often seems to be showing up just to say, "Hey, remember me? I'm still scary!" Roskam and Lehane eventually pull all their stray plot strands together into a climax that makes good on the film's surplus of foreshadowing. It's a powerful ending, if not a surprising one, and establishes Hardy as a mainstream star to watch. As for Gandolfini, it's deeply regrettable that we won't have another chance to watch him on the big screen. But, regardless of the film's flaws, his fans should give The Drop a look. The Drop is not showing in any theaters in the area.